Some stripe are not stopping in line with others after the first operation. Responsible for having all stripes correctly aligned after first operation, are both rubber shafts. Each rubber shaft has a left and right support, and each support is under pressure by a pressure spring. Increase or reduce the tension on the springs, till you get a satisfying result. Reduce the tension of all four screws completely. Release the air pressure by switching off the main air supply. 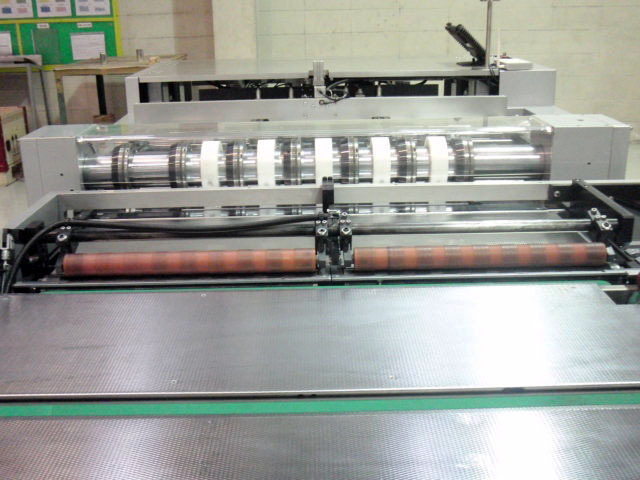 Both rubber shafts have to touch the lower rollers completely. Slightly undo the M8 of the main support, till the rubber shaft goes down automatically, then lock the screw again. Start to tighten the pin screw (for spring pressure tension) till each screw does touch the spring. Turn every pin screw between 2-3 revolution, but all the same! When you move the piston rod of the pneumatic cylinder completely in by hand, the rubber rollers must of course touch the lower roller, and you must see the springs get compressed further. Switch the main air pressure supply back on.